Modern design floor lamp that also beautifully decorates when not lit. With large lampshade in dark smoke glass, on a tight base of matt black, powder coated metal. Also available as a table lamp version. Modern design table lamp that also beautifully decorates when not lit. With large lampshade in dark smoke glass, on a tight base of matt black, powder coated metal. Also available as a floor lamp version. Modern matt white floor lamp with 2 adjustable and directional lampshades. The timeless design matches many interior styles. Also available with only one light source. Modern matt white floor lamp with 1 adjustable and directional lampshades. The timeless design matches many interior styles. Also available with 2 ight sources. Modern metal tripod floor lamp with copper accents and a light retro design. The matt colored, large adjustable lampshade makes the Mingle tripod strikingly sturdy in every interior. 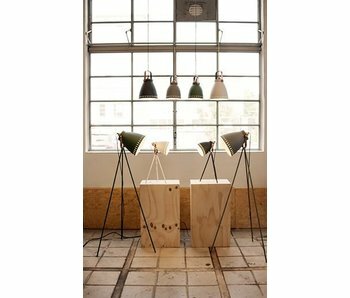 Modern metal floor lamp from Leitmotiv, with accents in wood and copper and a light retro touch. With 2 matt colored, agile caps for optimal light exposure, for example when reading in an armchair.